Peterborough Lions claim the eye-gouging offence pinned on their second row forward Marius Andrijauskas was ‘an accident’. The Lithuanian international was shown a red card towards the end of Saturday’s bruising and often punchy National League Division Three clash with Birmingham at Bretton Park. But Lions chairman Andy Moore insists the sending-off offence was not deliberate. After studying video footage of the incident, Moore stated: “There was a rolling maul and Marius put his arm over the shoulder of a Birmingham player who had his back to him and unfortunately put his hand across his face. “His fingers were by his eyes and as soon as Marius realised this he quickly took his hand away. “Nobody was hurt and nobody complained. It was accidental - you can clearly see that from the video. Because there are no English Clubs Championship games this weeke nd, the disciplinary hearing is likely to be next week. The Lions lost Saturday’s game 19-7 to a Birmingham side who relied heavily on their big, beefy pack for victory. They kept it tight and for the first half the Lions never got a sniff. They improved after the interval after reshuffling their front row and looked like earning a losing point after winning a penalty try through good scrummaging. That made it 14-7 but Birmingham, who have recently invested heavily in new recruits ready for a serious promotion push next season, scored an injury-time try to make it a pointless afternoon for the Bretton side. Joe Sagoe was the star of the show for Oundle as they clinched the Midlands East Division Three (South) title on Saturday. The swashbuckling centre, one of several ex-Peterborough Lions players in the Oundle side, scored three tries within 18 first-half minutes to pave the way for a 29-8 win over Dunstablians at Occupation Road. Saad Sait, another ex-Lion, and Toby Snelling were Oundle’s other try-scorers. There are still three games to go but Oundle can’t be caught and will be strutting their stuff alongside Peterborough in Division Two next season. That is of course assuming that Borough aren’t relegated. Borough are certainly making hard work of securing their survival in Midlands Division Two East (South). A 13-3 defeat at home to Vipers on Saturday in a very uninspiring game leaves them still needing at least one win - possibly two - from their remaining four fixtures. Three of those games are, however, against teams in the bottom three. Borough seconds are doing so much better. Andy Shearer’s side made it 14 wins on the trot when overcoming Huntingdon seconds 22-14 on Saturday with tries by strong-running centre Matt Amos (2) and skipper Nathan Holt. Prop forward Dino Perna and flanker Owen Garner made solid debuts. Borough seconds take their proud record to Thorney on Saturday for a Hunts and Peterborough Cup semi-final showdown at the Ron Jacobs Playing Field. Kick-off is at the earlier time of 2pm so that supporters can watch the England v Wales game at 4pm on the big screen in the clubhouse. A seven-a-side tournament played at Peterborough Rugby Club has been awarded England Rugby Sevens Qualifying status. That means the winners of the competition for Elite teams at this year’s SRG Beach 7s Festival at Fengate on June 4 will go forward to the regional finals of the England Sevens Championship. 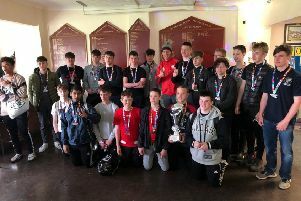 It’s a feather in the cap for Borough and for organiser Sam Sargeant, a former Borough player who runs the tournament under his SRG Sports Events banner. Last season 26 teams battled it out for two cups. This year the entry is well up. So far there are 39 teams from all over the UK entered for four competitions.